Comprised of two hinged cast iron plates, the top plate carries the motor and countershaft whilst the bottom plate is secured to the lathe's machined aluminium base unit. 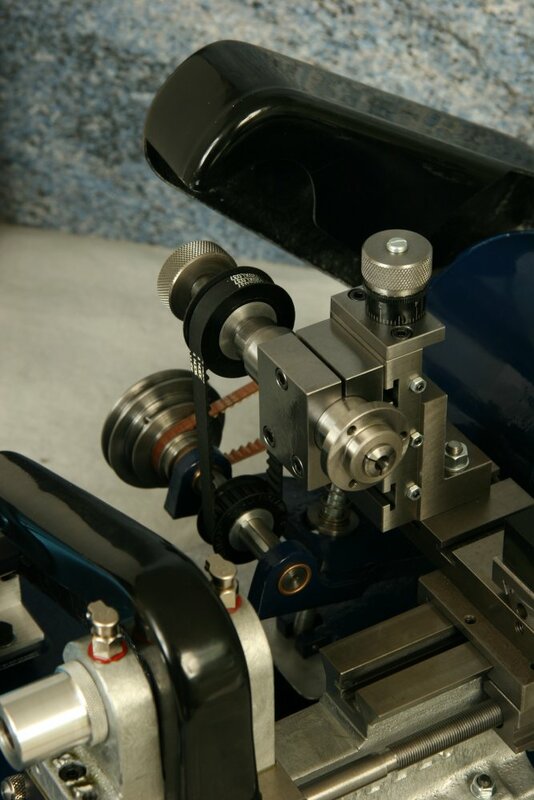 The bottom plate is provided with two elongated counter bore slots permitting the assembly to be moved forward and fixed (toward lathe headstock) and back and fixed (toward lathe tailstock) depending on the point at which the work piece requires machining. The top plate casting houses the bronze bushes in which the countershaft runs. The shaft is fitted with a key and the toothed drive pulley broached permitting the pulley to travel the full length of the countershaft. The two toothed pulleys, (countershaft and milling head connected via toothed belt drive) are thereby kept in vertical alignment as the lathe's cross slide is moved forward and back. The toothed belt drive is tensioned through the weight of the motor and is further tensioned by fine spring adjustment for smooth operation. 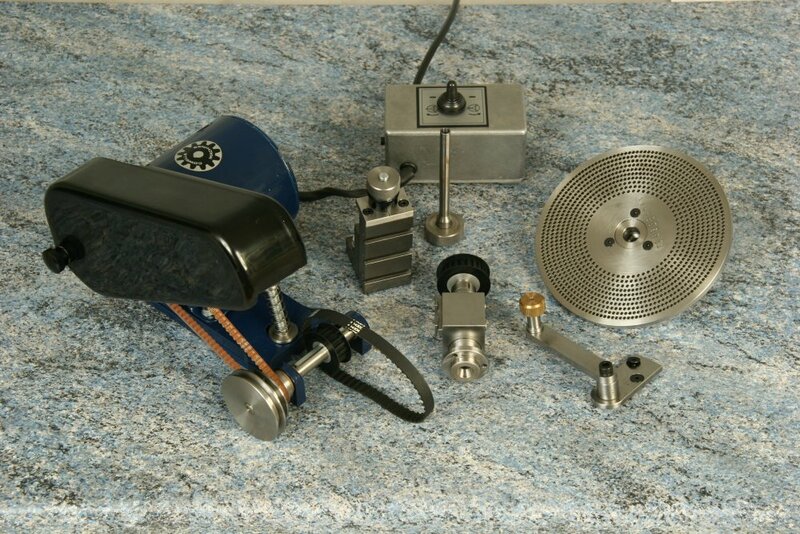 Three spindle speeds are provided through the 3-step Vee pulleys fitted to motor and countershaft. The continuously rated motor is fitted with forward and reverse. The drive pulleys are shrouded by a quick release fibreglass cover guard. The Steel mounting block of the Milling head secures to the Vertical Milling Slide's table via a machined tenon and tee bolts. The mounting block houses the milling spindle cartridge and a pinch bolt is provided to lock the cartridge in any desired position. The cartridge is fitted with opposed cone phosphor bronze bearings front and rear with a hardened and ground steel cone running in the rear bearing. A fine threaded adjuster nut fitted to the rear of the milling spindle acts upon the steel cone for the elimination of spindle end-float. This high quality bearing arrangement ensures longevity and spindle concentricity and eliminates 'tool chatter' so often found in machines fitted with small inferior ball bearings. 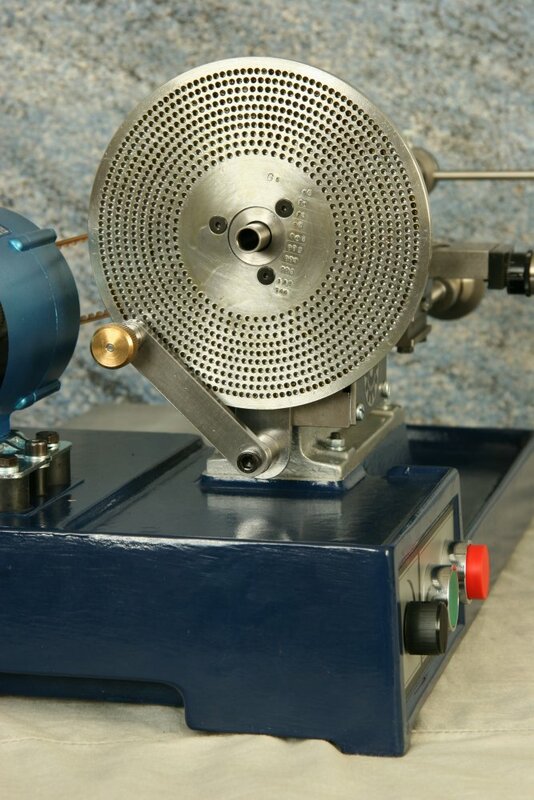 The Milling spindle is hardened and ground and directly accepts 8mm (WW) collets (see accessory page for the Wheel & Pinion Cutter) and tooling. The typical T.I.R. (total indicated run-out) being 0.005mm (0.0002"). A toothed pulley is fitted to the rear of the spindle to pick up drive from the motor and countershaft unit. (A speed reduction pulley is available for pinion cutting; see the Wheel & Pinion Cutter accessory page). A draw bar is supplied as standard. The Vertical Milling Slide (RG55 supplied as standard) carries the milling head, and secures to the cross slide of the lathe. 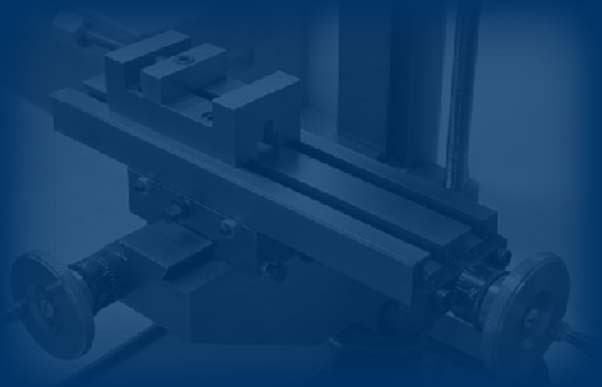 Cross feed is thereby affected through the lathe's cross slide, vertical feed through the vertical slide and longitudinal feed via the lathe's leadscrew or saddle lever feed. A range of five 150mm (6.00") diameter headstock division plates (G1-G5 see accessory page for WheelΠnion Cutter) is available. One division plate of the customer's choice is supplied with the unit. The division plate mounts upon an adapter that attaches to the rear of the 90CW lathe's headstock spindle. A sturdy detent mechanism with a spring-loaded detent pin ensures a positive location in the division plate to eliminate headstock spindle movement.